In the Ducktales series, Uncle Scrooge is famous for highdiving into his money bin. I've always wondered how he does it without hurting himself. Wouldn't he bang his head and knock himself out? Is there an in-universe explanation? It took him years of practice. Scrooge: Are you out of your head? You'll crack your skull open! Huey: But you swim in money all the time! Scrooge: Yes, but I worked hard to perfect that skill, building muscles and dexterity. 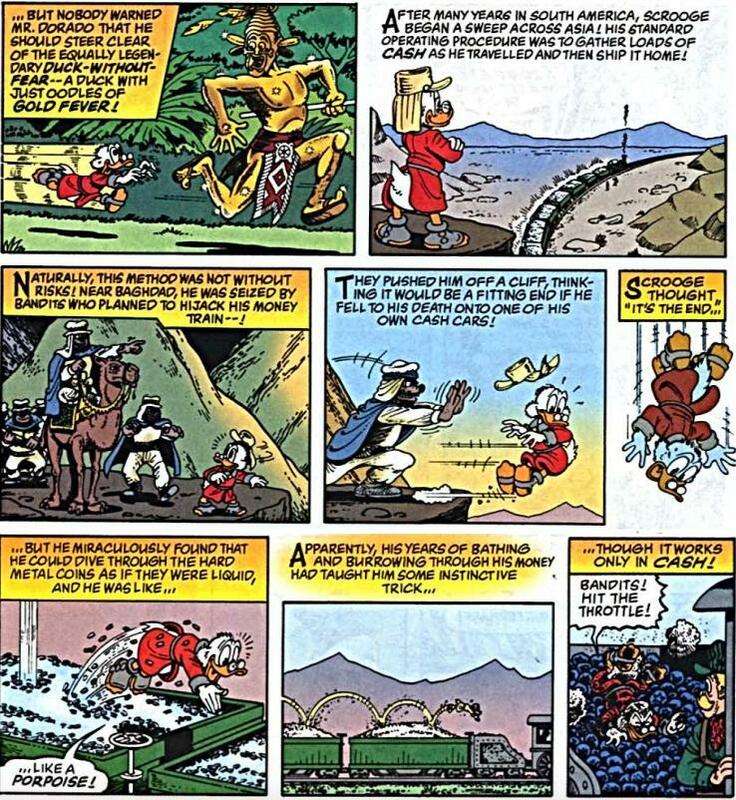 In the comics there is also an explanation: in the eleventh part of the comic book The Life and Times of Scrooge McDuck, by Don Rosa (The Empire-Builder from Calisota), where Scrooge is pushed off a cliff by some bandits planning to hijack his train full of gold. "[...] Scrooge thought "it's the end" but he miraculously found that he could dive through the hard metal coins as if they were liquid [...] Apparently, his years of bathing and burrowing through his money had taught him some instinctive trick [...]". Not the answer you're looking for? Browse other questions tagged ducktales or ask your own question. How wealthy is Uncle Scrooge in the Don Rosa/Carl Barks universe?